Whether it's family or friends coming over for Easter lunch you need to put on a feast to remember! Read on and get the insider’s guide! Combine the greens, basil and mix together in a large bowl. Add the shredded carrots, peas, and shallots and drizzle the dressing on the top of the salad. 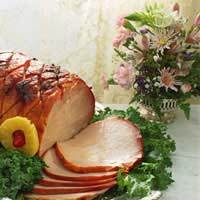 A ham is a fairly traditional dish to serve at the core of your Easter dinner. The key to this dish is the fruity glaze that brings the flavours of spring to the table. Roast the ham in an oven at a medium heat for about two hours. Reduce the temperature to low and cook until the ham is golden. Make the glaze by mixing the ingredients together and place in a saucepan. Cook over a medium heat and cook until the glaze thickens. Once the ham and glaze is ready, use a pastry brush and glaze the ham fully. Return the ham to the oven and roast until brown. Serve with roast potatoes and greens. Easter wouldn’t be Easter without Hot Cross Buns! They are marked with a symbolic cross and can be served cold, hot, with or without butter and jam, toasted or not. Making them however is no easy task and these days it’s easier to head to a shop and pick up some pre-prepared ones. Serve them alongside an indulgent dessert. Here is a chocolate cake recipe that will get the guests salivating! Melt the butter and chocolate over a low heat. Separate the eggs and then slowly add to the mixture. Greaseproof a tray and pour the mixture in. Place in the oven and cook for thirty minutes at a medium heat. Do the knife test if you are not sure if it is ready. Leave to cool and serve to your guests with some rich vanilla ice cream! Easter is a time of celebration. And modern conventions have made it quite a fun time of year. Don’t be afraid to veer into the kitsch side of things! Flowers in bloom are a key Easter trend and if you are having a dinner party be sure to distribute them generously around the home and garden. As guests approach the house, you can remind them of the joys of the season by placing small bunnies among the flowers and plants to act as a warm welcome! Place an Easter basket of sweets in a central place in your home so that guests can indulge when they want to and make the dinner table as festive as possible. A single flower on each place setting with a full bouquet in the centre will decorate the table. Ribbons tied around each set of cutlery will similarly add a sense of occasion. As they leave the gathering a little bag full of gifts will be a nice touch. Instead of paper or plastic bags, get hold of small baskets – one for each guest or for each couple. Place a handful of daffodils in each and fill with chocolate eggs and/or sugared almonds! Easter feasts are easier and less serious than their Christmas counterparts. There is very little expectation. All your guests will want is time together and some good food and you will definitely be able to manage that!